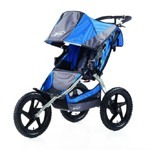 The improved Joolz Geo 2 is a stroller that will get you through any kind of terrain. It comes with a plenty of configurations – you can use it as a single, or a double tandem. You can attach two bassinets, two toddler seats or two baby car seats however you like. 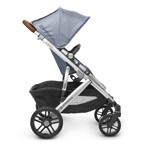 Every modern family looking for a stroller that will grow with them should consider the Joolz Geo 2. The most captivating features of the Joolz Geo 2 include the impressive modern frame, luxury fabrics, and customizable accents. The most remarkable feature, however, is the second toddler seat, which can take the place of the basket, giving the appearance of a lounging chair. The wheels are not only large but also durable enough to run on all terrains, courtesy of the all-wheel suspension. So, you can rest assured of a smooth ride on the grass, snow, or even mulch. With the Joolz Geo 2, navigation is super simple; the 24” width means it can be easily maneuvered, even on the busy streets. There is a matching bassinet kit, making it suitable for even a new birth. You can keep up to 45 lbs weight conveniently in the roomy and reversible seat. 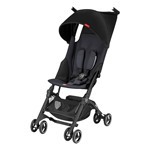 A compatible baby car seat is all it takes to convert the Jools Geo 2 into a travel system. Other notable features include the large SPF 50+ canopy (with a pop-out sun visor), an adjustable handlebar, easy-fold, auto lock, adjustable bar, spacious basket, all-terrain tires, and deep two-hand recline among others. You can customize some features of the Joolz Geo 2 to your taste. Simply choose among the three main collections, and specify your wheels, frame, and accents. 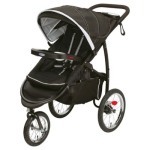 Convertible stroller 33 x 24 x 37–43 in Stylish, solid, spacious, super smooth to steer, suitable for all terrain. The three-option recline reversible seat is great, but the same cannot be said of its controls. There are two buttons on the side of the seat, dedicated to the control of the seat recline. The position of these buttons makes them difficult to reach. In fact, you will have to stop your stroller, move to the side of the seat, and push both buttons to recline the seat. That’s rather inconvenient. The ‘v’ shape of the seat is always retained. Hence your child still maintains the sitting position even when you recline the seat fully. The weight limit of the seat is 45 lbs, and with its slightly elevated position on the frame, it can pass as a high chair at a restaurant. 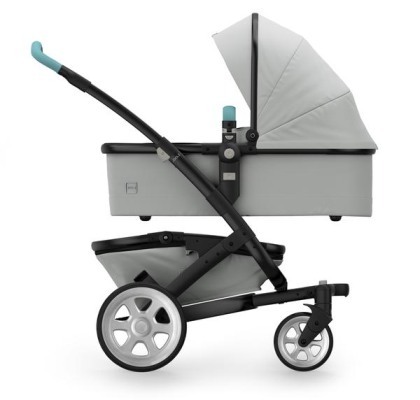 There are a frame and two sets of fabrics in the Joolz Geo 2 – each for the seat and bassinet, and consequently, there is no adjustable leg rest. Perhaps, this is a disadvantage, considering that other models have an adjustable leg rest and sell for lesser prices. The 5-point harness is padded and adjustable. It also comes with a center release button. The Joolz Geo 2 comes with a removable, leathered, and swing-away handlebar for easy movement. The Jools Geo 2 has a great canopy equipped with three big SPF 50+ panels that are waterproof and a pop-up sun visor that offers ample coverage. There is a hidden dark mesh on the last panel, and this is responsible for better ventilation. 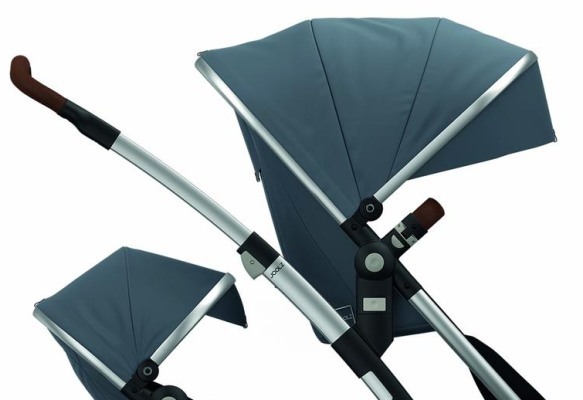 The canopy’s inside has two toy loops for keeping the favorite toys of your child close. 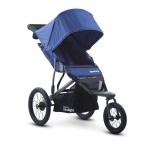 The modern look of the stroller is further complemented with the aluminum accent piece on the canopy. 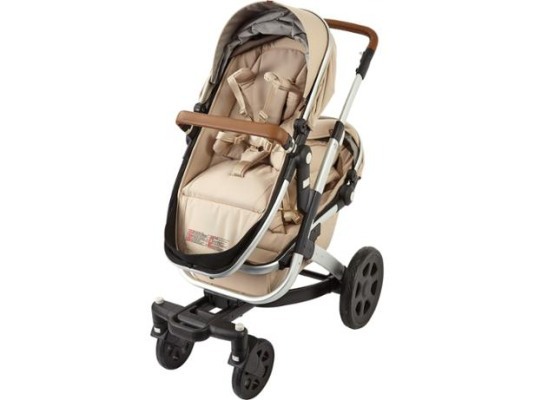 Covered in luxurious cognac leather, the telescoping handlebar present in this stroller goes from 37” up to 43” from the ground. It also has two hooks for hanging your diaper bag. 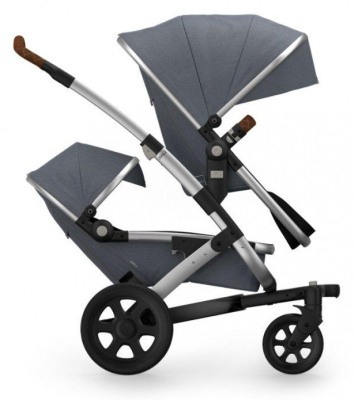 Joolz Geo 2 is a great stroller that has a modern, classy look, can be converted into a double stroller, comes with an all-wheel suspension and is suitable for any terrain. Check how much it currently costs on Amazon, maybe you can find an attractive discount. 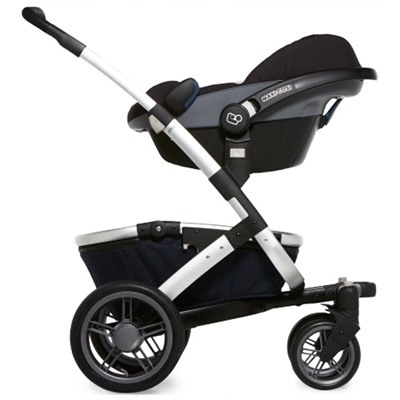 The basket you have in the Joolz Geo 2 offers ample space and an impressive weight limit of 22 lbs. It can be easily reached since the back is a bit inclined downwards. The wooden base means the basket doesn’t sag to the ground, while the aluminum frame highlights its modern appearance. The Joolz Geo 2 rolls on four all-terrain wheels. The two front wheels are 8” while the two at the back are 11.5.” They are built to be durable and strong enough to roll smoothly and easily on various terrains, including gravel, grass, or uneven pavement. 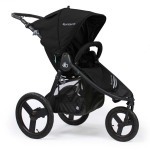 If you are the type that goes on long walks at the park or in the city center, you are in safe hands with the front wheels of the stroller – they can be locked straight and at the same time swivel. Your baby gets additional protection, with the independent shock-absorbing front and rear wheel suspension. The brake is found on the right wheel, but it may be difficult to apply when you are wearing a flip-flop. Although not single-handed, the bulky fold in the Joolz Geo 2 is easy and straightforward to use. It takes minimal effort to fold, even when the seat is attached. Pulling the levers on the handlebar is all you need to do to see the stroller collapse down on its own. You have an automatic lock, but no standing fold. If you wish to roll the Joolz Geo 2, there is a nice handle in the front for that. However, you will have to bend down a little so that the handlebar and the canopy do not drag on the ground. When folded and the seat attached, the stroller has a dimension of 38”L x 24”W x 22”H – a similar dimension to the UPPAbaby Vista. The bassinet in the Joolz Geo 2 is matching and is available with a single seat frame and two fabric sets – a bassinet fabric and a seat fabric. 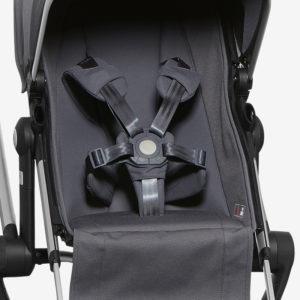 If you wish, you could convert your Joolz Geo 2 into a travel system with compatible car seats, although you would have to buy the adapters separately. Compatible car seats include, Maxi Cosi Mico Max 30, Maxi Cosi Mico 30, Maxi Cosi Mico Nxt, Nuna Pipa, Kiddy Evolution Pro, Kiddy Evoluna iSize. Adding a second seat to your Joolz Geo 2, usually at the back and as a replacement to the basket, will turn it into a double tandem. There is no front option, but this does not take away from the uniqueness of the seat. The seat could pass as a lounging chair, considering that your child’s legs are in the open. There is also a small canopy and a small recline. Even with these fixtures, the stroller maintains its compact size, thus making it easier to maneuver even in tight spaces and crowded streets. Note that with a second seat, you lose the storage basket. Also, if you have an older child, he or she might not find the seat comfortable. There is no rear wheel fenders; your child will most likely be touching the rear wheels. The second seat may accommodate a kid up to 45lbs. 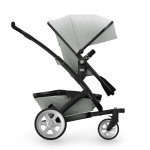 You can find the Joolz Geo 2 in six main colors (Elephant Grey, Gris, Hippo Grey, Noir, Parrot Blue, Camel Beige). However, it is customizable in 20 accent colors. To customize to your taste, you are allowed to pick your favorite frame and wheel colors. 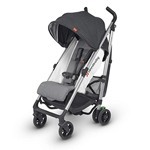 If you are considering purchasing a Joolz Geo 2, see what other parents are saying about this stroller. Small second seat. Although it sports a special lounging design, the second seat lacks a sizable canopy, and it is not spacious. Quite expensive. The stroller plus bassinet, without the second seat or adapters, sell for about a thousand dollars. 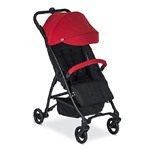 As I mentioned before, Joolz Geo 2 is not one of the cheapest strollers you can find out there. If you are considering buying a convertible stroller, and if Joolz stroller exceeds your budget budget, you can consider UPPAbaby VISTA. 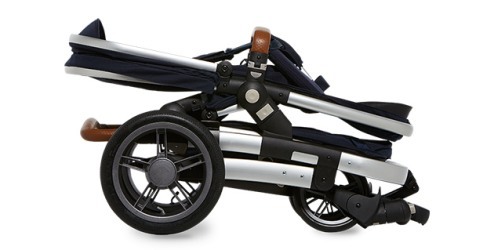 Both strollers are very similar and have many common features. 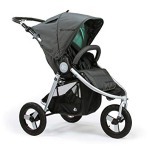 Joolz Geo 2 is a very good conertible stroller, which is made of the highest quality materials. Its look is modern and will certainly appeal to many parents. Despite its disadvantages, it is a great product that I can trully recommend. The price is quite high, but you pay for high quality. Of course there are cheaper alternatives on the market, but it’s worth considering Joolz Geo 2. If you are not sure if you want to buy it, read the reviews of other parents on Amazon.